chocolate fudge - quick and easy recipe of chocolate fudge with just 3 ingredients - chocolate, condensed milk and butter. first line an aluminium foil or butter paper in a 6 x 6 inch square pan. the foil or butter paper has to cover all the sides. take the chocolate in a bowl or pan. if you have a slab of chocolate, then just keep the whole slab in a zip lock bag and with a pestle, break the chocolate. also add 200 grams condensed milk and 1 tbsp butter. you can use either salted or unsalted butter. keep the bowl or pan aside. you could use any good quality chocolate. good quality chocolate chips can also be added instead of chocolate. heat water till it becomes hot, in a pan or dekchi/pot. lower the flame and place the pan or bowl of the chocolate, condensed milk and butter on the pan. stir and allow the chocolate to melt. continuously stir the fudge mixture while melting the chocolate. once all the chocolate is melted, switch off the flame. quickly add chopped walnuts and vanilla extract or vanilla powder. stir very well. then pour the whole chocolate fudge mixture in the pan lined with aluminium foil. let the fudge cool at room temperature. do not cover the pan. 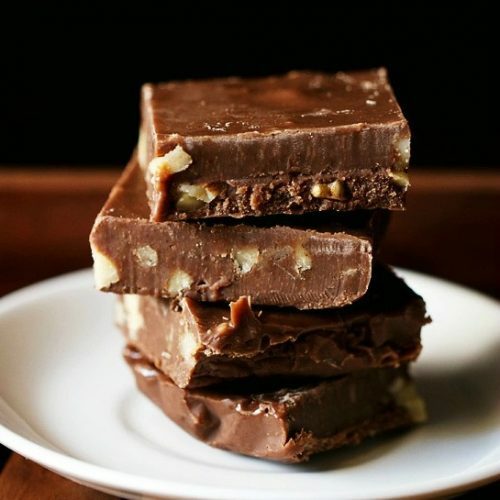 once the fudge has cooled at room temperature, cover the pan and refrigerate the fudge for 2 to 3 hours or overnight, till it sets completely. later remove the chocolate fudge along with the foil and place it on a chopping board. slice the chocolate fudge into squares. serve these chocolate fudge or wrap them in foil or butter paper and keep covered in a jar or box in the fridge. milk chocolate - dark chocolate, white chocolate or chocolate chips. walnuts - any dry fruits of your choice. the recipe can be doubled.